A volunteer firefighter in Massachusetts made a horrifying discovery on Christmas Eve when he realized that the dying woman he was pulling out of a mangled car was his own daughter, authorities said. Katie Hamilton, 30, of Brookline, was pronounced dead at the scene after her car was rear-ended, sending her into oncoming traffic that struck her vehicle a second time, according to the Brookline Police Department. Hamilton’s father was one of the firefighters who responded to the scene, according to ABC affiliate,WMUR. “I know that she is a young mother. She’s, like I said, been in the community for a long time. Her family are impeccable people who are highly respected throughout the town and surrounding communities,” Brookline Police Chief Bill Quigley told WMUR. 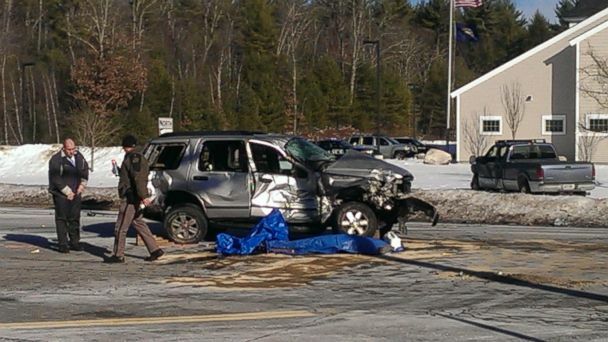 The incident happened around 9:05 a.m. Tuesday at the intersections of Route 12 and Route 130. “It’s a sad, sad day for all of us, not just because it’s Christmas Eve, but because of the relationship of the deceased,” Quigley said. The New Hampshire State Police Accident Reconstruction Team was called to the scene for further investigation of the accident, according to a statement to ABC News. “It could be anything. We don’t have our fingers on exactly what it [was] just yet at this point. But, we are pretty certain that speed and impairment were not a factor so that would rule it down to driver distraction at this point,” Quigley said. No charges have been filed, according to WMUR.